As we witness horrendous events involving antisemitism, racism, and mass violence in this country and around the world, it is very important that we think about and act on the emotion of compassion that is a core tenet of nursing. My life and career has taken me from Iran to Sweden to the U.S. I have seen the people of each country suffer the consequences of extremism, social and political polarization, and loss of civil discourse and compassion. The outcome never works to the benefit of the average person. Medicine, and nursing in particular, are about service without prejudice or preconception toward a person no matter what his or her race, color, religion, sexual orientation, or country of origin. We were reminded of this today when it was revealed that three of the physicians who treated the alleged synagogue shooter in the emergency room were Jewish. I’m sure many of the nurses working that day were, as well. That they rendered the best possible care to someone who came into the ER yelling of his desire to exterminate every one of their faith is testimony to their professionalism. “First, we must realize that together, we can lift our voices. In the face of a national narrative — including divisive rhetoric in the public discourse mainstreaming and amplifying hateful ideas that had been pushed to the fringes — we must unite our voices against hate, violence and discrimination. We are, personally and professionally, not without options and opportunities to change the narrative. We must use our professional commitment to compassion as a core value that informs what we do and how we do it. We must be active, not passive, in responding to racism, sexism, bullying, antisemitism, and other acts of incivility. We must resist any tendency to divide, and we must seek ways to unite. 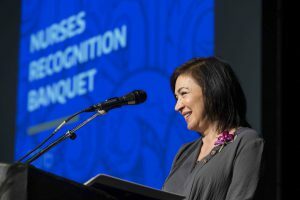 The UW School of Nursing seeks to educate nurse leaders. Now, more than ever, our leadership is important. We can, should, and must stand in solidarity with those who are demonized, as this profession always has. We must call out those who exploit fear and ignorance for the gain of personal power. We wield the most powerful of weapons—compassion. Let’s use it.